The wealthy Sackler family is facing new charges it fraudulently transferred money from Purdue Pharma, the firm it owns that makes opioid painkillers. In a lawsuit, New York's Attorney General said she will recover "billions of dollars" that were "fraudulently conveyed" from the firm to the dynasty.Purdue is facing thousands of lawsuits over how it marketed OxyContin, but only a handful have named the Sacklers Purdue and the Sacklers vigorously deny the allegations, a spokesman said.A spokesperson for the Sackler family said: "Expanding this baseless lawsuit to include former directors of Purdue Pharma is a misguided attempt to place blame where it does not belong for a complex public health crisis. The family "strongly" denies the allegations and will "vigorously defend against them".The lawsuit claims that money was transferred from Purdue Pharma to private or offshore accounts that are held by members of the Sacklers in order to protect the funds from litigation. 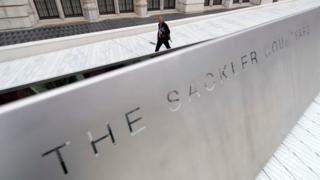 The Sackler family is worth $13bn according to Forbes magazine and have made millions of dollars worth of donations to the arts, education and science, mainly in the US and the UK.However, the Sackler Trust has now suspended new charitable donations in the UK. It follows a decision by National Portrait Gallery to give up a grant from the trust. The New York attorney general's lawsuit names eight Sackler family members, all of whom are linked to either Mortimer Sackler or Raymond Sackler, siblings who set up Purdue in the 1950s with their older brother Arthur. After Arthur Sackler died, Mortimer and Raymond bought out his stake in the firm.The family members named in the suit are Richard, Jonathan, David and Beverly Sackler, who are linked to Raymond.Dame Theresa Sackler, Mortimer D., Ilene and Kathe are also named in the claim and are related to Mortimer Sackler. However, the Sackler Trust has now suspended new charitable donations in the UK. It follows a decision by National Portrait Gallery to give up a grant from the Trust. Other organisations have also shunned Sackler money, including the Tate. The New York Attorney General Letitia James filed the lawsuit against Purdue Pharma last August, claiming that it oversold the benefits of OxyContin and failed to adequately address the potential risks of taking the drug, which include "serious abuse and death".That lawsuit has now been amended to include the Sacklers, many of whom were directors of Purdue. It has also been extended to trusts controlled by the Sackler family and other makers and distributors of opioid drugs.These include Janssen Pharmaceuticals, which is owned by Johnson & Johnson and Teva Pharmaceuticals.Ms James claims that Purdue, the Sacklers and the other companies named in the lawsuit "are largely responsible for "creating the opioid epidemic that has ravaged New York".The US Centres for Disease Control and Prevention (CDC) recently said that the US opioid epidemic is now entering its third phase. The first was started with opioid painkillers, the second was heroin which people moved to when they were unable to get more prescription medicine and the third is Fentanyl, a powerful opioid that has now entered the illegal drugs market.According to CDC, more than 70,000 people died of drug overdoses in 2017, 68% of which involved a prescription or illicit opioid.Purdue says that OxyContin represents less than 2% of total opioid prescriptions. Earlier this week, Purdue Pharma reached a settlement with Oklahoma for $270m after the state claimed it and other companies - Johnson & Johnson and Teva Pharmaceutical - had used deceptive practices to sell opioids.The deal was announced the day after Purdue Pharma failed to delay a trial over the claims made by Oklahoma state.Johnson & Johnson and Teva were not involved in the settlement. » Is this America's most hated family?